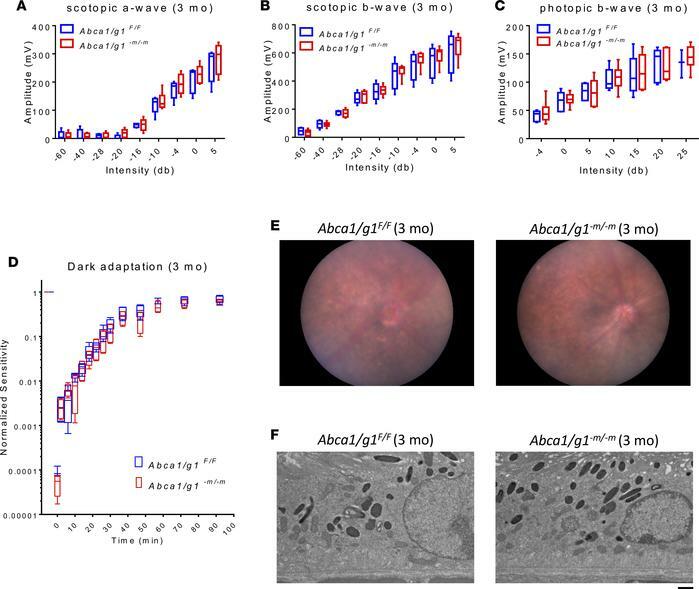 Three-month-old Abca1/g1–m/–m retinas do not show functional deficits or morphological abnormalities in the retina and RPE. (A–C) Electroretinography (ERG) of 3-month-old Abca1/g1F/F (n = 5) and Abca1/g1–m/–m mice (n = 6). (A) Scotopic a-wave amplitude. (B) Scotopic b-wave amplitude. (C) Photopic b-wave amplitude. No significant difference was detected by 2-way ANOVA. (D) Dark adaptation curves of 3-month-old Abca1/g1F/F (n = 5) and Abca1/g1–m/–m mice (n = 4). No significant difference was detected by 2-way ANOVA. (E) Representative fundus images of 3-month-old Abca1/g1F/F and Abca1/g1–m/–m mice. (F) Representative electron microscopy images of 3-month-old Abca1/g1F/F and Abca1/g1–m/–m mice retinal pigmented epithelium (RPE). Scale bar: 1 μm. Values are mean ± SEM.